You can't feed them after midnight, but you can listen to this podcast any time! 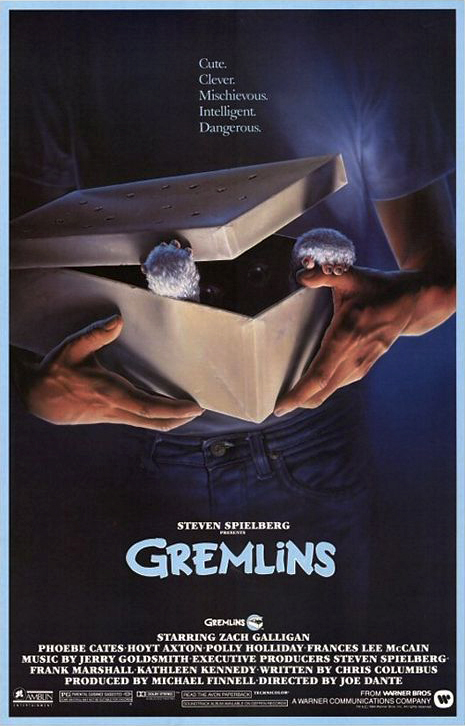 Join the Popcorn Poops this week as they watch and discuss Joe Dante's 1984 film GREMLINS. This week's movie was Jessica's pick. Tune and listen to Dustin and Jessica chat about what some may consider a holiday classic, although that's hardly the term they'd use to describe it. Find out why the Poops not only consider GREMLINS to be a bad movie, but a bad Christmas movie specifically. Be sure to subscribe on iTunes, Stitcher, and anywhere else you get podcasts. Leave a rating and review on those platforms, and it might get read on the show. Follow Popcorn Poops on Twitter and like the Facebook page to stay updated on upcoming episodes. That's also where you can participate in a weekly movie still identification game. Be the first to identify the movie from the screenshot, and you'll be mentioned on the podcast. If you'd like to support the program, please visit Audible and sign up for a free 30-day trial of their audiobook subscription service. You'll also receive a free audiobook that is yours to keep whether or not you continue with your subscription after the trial period has expired. Be sure to use the URL provided so they know who sent you.